Beth Dolgner started writing short stories at a young age, and having a journalism teacher for a dad certainly set her on the right track. After she graduated from Florida Atlantic University with her degree in Communications, Beth began working as a freelance writer, journalist and public relations representative. Georgia Spirits and Specters, Beth's first book, debuted in the spring of 2009 and was followed by Everyday Voodoo in 2010. 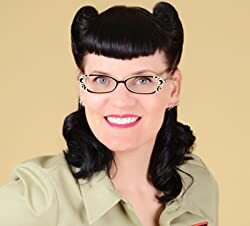 She has a lifelong interest in the paranormal and is an active member of West Georgia Paranormal Investigations.Beth made her fiction debut in October of 2011 with the paranormal romance "Ghost of a Threat," the first in the Betty Boo, Ghost Hunter series.In her free time, Beth enjoys traveling, sewing and riding motorcycles. She and her husband Ed live in Atlanta, Georgia, with their five cats. Beth is online at www.BethDolgner.com. Please enter your email address and click the Follow button to follow Beth Dolgner!